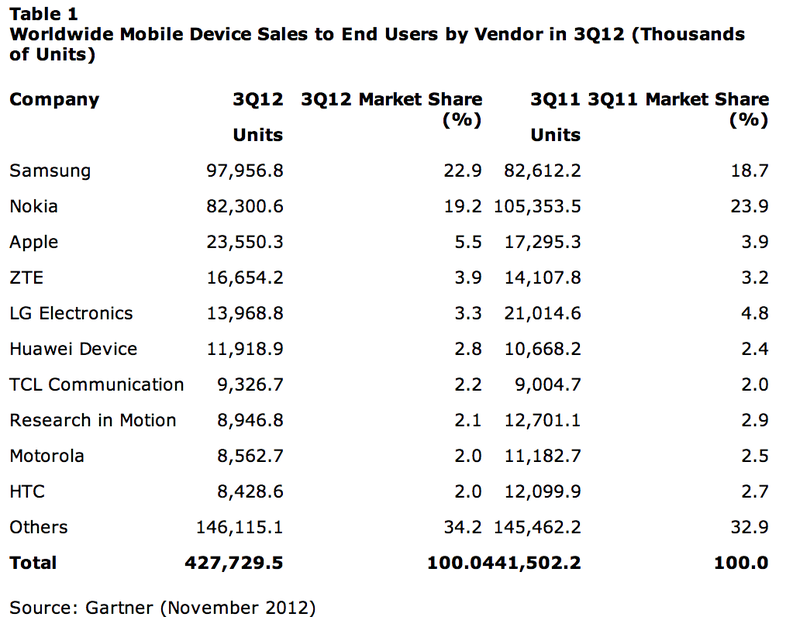 Gartner is out with its quarterly report for worldwide mobile device sales by vendor and OS for the third quarter. While reporting an overall 3 percent decline in mobile phone sales, the smartphone category hit 169.2 million units in Q3, a 47 percent increase from the year-ago quarter. While Apple is still third to Samsung and Nokia for total mobile device sales, Samsung and Apple remain the top smartphone vendors collectively, capturing 46.5-percent of the market. Meanwhile, Nokia slipped from No. 3 smartphone vendor in Q2 to No. 7 in Q3. This made room for RIM and HTC behind Apple and Samsung in the third and fourth positions. Samsung’s mobile phones sales continued to accelerate, totaling almost 98 million units in the third quarter of 2012 (see Table 1), up 18.6 percent year-on-year. Samsung saw strong demand for Galaxy smartphones across different price points, and it further widened the gap with Apple in the smartphone market, selling 55 million smartphones in the third quarter of 2012. It commanded 32.5 percent of the global smartphone market in the third quarter of 2012.